Each year, thousands of Ethiopians – many who are Christian – immigrate to the United States. Over the past decade, the LCMS has begun to connect to many of these immigrants, and now LHF is adding its support with Amharic and Oromo translations of Lutheran books like the Book of Concord, catechisms and A Child’s Garden of Bible Stories. As Ethiopian immigrants search for a new church home, some are starting to come into contact with LCMS congregations. LHF Executive Director Rev. 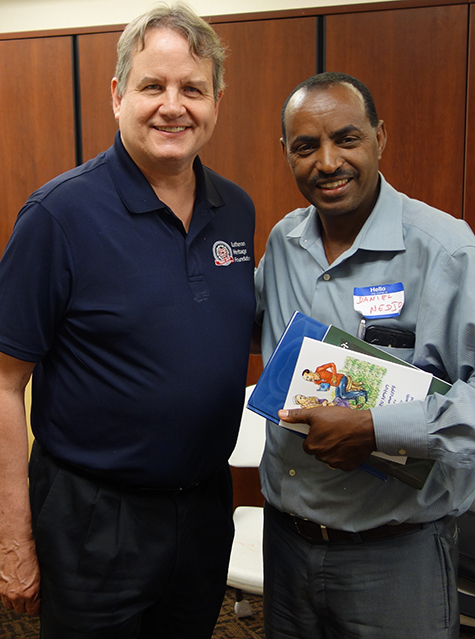 Matt Heise recently attended an Ethiopian outreach conference in Las Vegas, where he met with Oromo-speaking Christians like Daniel Nedjo to discuss their needs for Lutheran materials. LHF Executive Director Rev. Matthew Heise recently attended a gathering of Oromo-speaking Ethiopian Christian mission leaders. LHF has already translated several books into the Amharic language for Ethiopians, and the Oromo Small Catechism and A Child’s Garden of Bible Stories are underway. The books will be used not only among immigrants here in the United States, but also in Ethiopia. “This region of the globe has been the major focus of the Arabs and other Muslim countries,” shared Rev. Olana. “The Arabs always felt and perceived Ethiopia as a Christian state that blocked the spread of Islam to the rest of East African states. “Today, fundamental Muslims are getting advantage of religious freedom in Ethiopia to launch and propagate their doctrine in the rural area,” he continued. “Several Oromo youth have been transported to Libya, Sudan and Saudi Arabia for Islamic training. This is a looming danger, which will soon confront the evangelism effort at its infancy. Islam is becoming a threat to Ethiopia, and especially to the Oromos. “So LHF translating some of the basic Lutheran confessional teachings into the Oromo language as much as possible is a critical strategic missional endeavor, one that not only support the EECMY ministry in Ethiopia, but the diaspora Oromo churches as well,” Rev. Olana concluded.